Have you ever wondered what's inside a sacred space in your community? Maybe it's the Hindu temple in the hills, a chapel on the local college campus or a mosque downtown in the business district that you've always been curious about. Perhaps you've admired a beautiful Zen garden or lily pond and wondered how it came to be? Sacred Spaces Tours reach across cultural and religious boundaries and use architecture and physical space as a way to appreciate the many different paths to spiritual fulfillment that comprise America's pluralistic society. Of course you don't have to be part of an organized group to enter a sacred space in your community. Did you know that many religious and spiritual sites are routinely open to the public? Some are actually designated historical and civic spaces. Download our free "Visiting Sacred Spaces: A How-to Guide" for tips on how to plan a visit to sacred spaces in your area. Written by Deirdre Colgan, executive director of Sacred Space International especially for the God in America national outreach campaign, the handbook is filled with tips for individuals and groups and covers everything from etiquette and dress to questions to consider about the architecture. The guide also includes a list of national organizations and a detailed glossary of terms from altars to zendo. Whether you're planning a community-wide event, or hoping to visit a sacred space you walk by every day, this guide is a valuable resource. Download the How-to Guide here. Together with the Chicago-based nonprofit Sacred Space International and with local PBS stations and community partners, God in America has curated self-guided Sacred Spaces Tours in eight American cities. 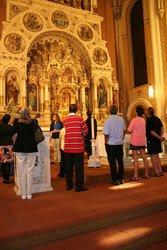 Click on a city name to learn more or view a slideshow of some of our sacred spaces. The eight city guidebooks were written by Deirdre Colgan, executive director of Sacred Space International and designed by a team of architects from the organization. Field research and principal photography was conducted in the summer of 2010 through in-person visits and recorded interviews with clergy and staff. To be included in a city guide, a site had to offer at least some free access to the public, be willing to engage in interfaith dialogue, and not be under significant construction during the launch tour weekend in October. Each guide contains a letter of introduction from Deirdre explaining how the city's sacred spaces were chosen. Do you have a sacred space of your own? Tell us about it! Sacred Space International was founded in 2002 by Suzanne Morgan to promote interfaith education and dialogue through the understanding of religious architecture. Morgan, a retired architect with expertise in liturgical design, started the organization in response to the events of Sept. 11, 2001, and the subsequent climate of social tension, cultural misunderstanding and fear. She conceived the idea of religious architecture as a catalyst for interfaith dialogue and education. Without promoting any single faith or tradition, the organization seeks to use the common language of architecture as an educational means to foster reciprocal respect, awareness and appreciation of the different traditions that comprise our pluralistic society. Visit Sacred Space International's website for more information.